On October 27, 2011, Johnny Carter, owner of the National Recording Corporation of Rome, Georgia, invited Sylvia Dyer Turnage, to the NRC studio to record the song she had written about the invention of an airplane by their great, great grand-father, Micajah Clark Dyer. Sylvia wrote the words and music in 1994, but this is the first recording of the song. The ballad recounts the full story of Clark’s dream of flying, his neighbor’s reaction to this wild idea, his labors in getting the aircraft built with primi-tive tools, and his ultimate success in piloting his craft off Rattlesnake Mountain in the rugged terrain of North Georgia in the 1880s. Following the recording session, Johnny produced a CD and designed the case cover pictured here. It is available for purchase for $10 and the proceeds from sales will be used to further efforts in acquainting the public with the historical importance of Clark’s invention at this early date in history. Orders can be placed by sending a check payable to the Micajah Clark Dyer Foundation to the address shown above. Please include information as to where the CD is to be mailed. Artist Doris Durbin of Blairsville, Georgia, painted the above portrait of Clark Dyer, working from an old image believed to be Clark and his wife, Morena, which was apparently taken in the 1880s and discovered about a year ago in the possession of one of Clark’s great, great granddaughters. The Micajah Clark Dyer Foundation is placing a copy of Ms. Durbin’s painting in the Union County Public Library in Blairsville alongside copies of drawings of Clark’s “flying machine” presently displayed in the Heritage section of the library. 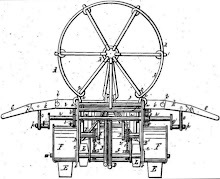 The drawings are from Clark’s U.S. Patent No. 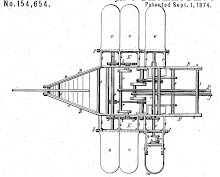 154,654 granted September 1, 1874, for his Apparatus for Navigating the Air, which he built and flew in Union County in the 1880s, giving him the distinction of being Georgia’s earliest aviator. A copy of the painting will also be placed in the Union County Historical Society’s Museum to become a part of the Micajah Clark Dyer Exhibit already on display in the Museum. The Museum is located in the Old Union County Courthouse on the square in Blairsville.